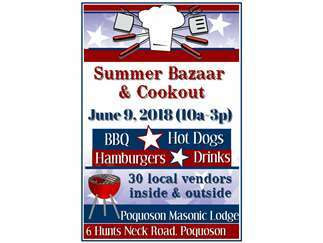 Let's start the summer of 2018 together shopping/browsing with fantastic local vendors PLUS...an amazing cookout! Come get your BBQ, Hot Dogs and Hamburgers. We appreciate your support for the Poquoson Lodge and their programs.